Mozart: Piano Concertos Nos 14 & 21; Recitative and Rondo "Ch&apos;io mi scordi di te?" On 9th February 1784, Wolfgang Amadeus Mozart entered the Piano Concerto No.14 in E flat major in his personal catalogue of works, and exactly 13 months later he completed his 21st concerto, in C major. 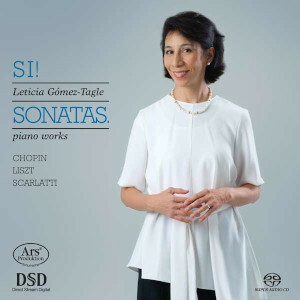 In little over a year he had composed seven piano concertos – all of them highly individual works exploring the relationship between solo instrument and orchestra in different ways, as the two concertos recorded here demonstrate. The E flat major concerto is written for piano and strings, with ad libitum parts for oboes and horns, and can according to Mozart&apos;s own instructions be performed with just a string quartet accompaniment. As might be expected there is a chamber music quality to the work, with the piano closely integrated into the ensemble. In complete contrast, Piano Concerto No.21 is written for a much larger orchestra, with flute and pairs of oboes, bassoons, horns, trumpets and timpani as well as strings. It is one of Mozart&apos;s most popular, but also most technically challenging concertos – when commenting on the score, his father Leopold noted that it was &apos;astonishingly difficult&apos;. Largely because of its slow movement theme (famously used in the film Elvira Madigan), the C major Concerto has become perhaps Mozart’s most widely known. Separating the two concertos on this disc is the concert aria Ch&apos;io mi scordi di te? (‘That I forget you?’) for soprano and orchestra with an obbligato piano part. Mozart composed the work in 1786 for the English soprano Nancy Storace and himself, possibly as a farewell gift to Storace, who was returning to London after a stay in Vienna during which she had sung the role of Susanna in the first production of The Marriage of Figaro. Another internationally acclaimed English soprano, Carolyn Sampson, joins Ronald Brautigam and the Kölner Akademie on this the seventh instalment of a series which goes from strength to strength: its predecessor (BIS-2044) was recently made an Editor&apos;s Choice in Gramophone, as well as an &apos;IRR Outstanding&apos; in International Record Guide. This is, even by the standards already set in this cycle, a revelatory release from Brautigam, Willens (& Sampson). The balance between orchestra & soloist(s) is pitched to perfection so that details, impossible to hear in "concert balanced" recordings of modern instruments, delight the ear from beginning to end without being obtrusive in any way whatsoever. 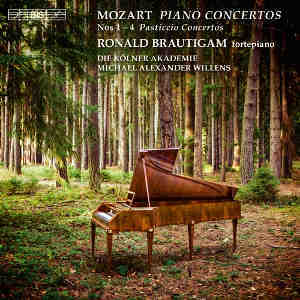 Opening the disc with (arguably) Mozart&apos;s most famous work of this genre, the chamber-like forces of Willens nonetheless conjure a wonderfully grand sonority for the tuttis but this is not what makes the heart want to with joy; no, it is the way the sustained woodwind caresses the intricate solo part of Brautigam. 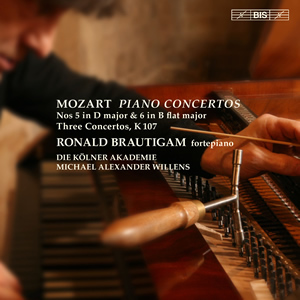 And of Brautigam&apos;s playing? This is in itself a thing of wonder: the quasi-Alberti bass tour-de-force is so carefully carefully balanced so that while this chortles away, it is never made a focus of attention except for when the melodic material in Brautigam&apos;s part (or that in the orchestra) is drawn to the listeners attention. The period instrument sound for the famous Andante is so very different to what any modern instrument version can hope to achieve; Willens & his violins are achingly spare in their exposition of this glorious melody. 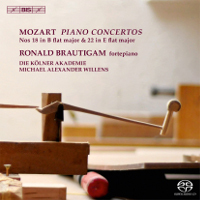 After Brautigam&apos;s entry, the orchestral contribution reacts deftly to the solo line both as an ensemble and also as individuals duetting with Brautigam. The way Brautigam and the woodwind mimic each others accompanying triplets is a marvel and the blend of all the forces at the close is extremely sensitive indeed. The finale positively fizzes with joy and brings the work to a celebratory conclusion; the mini-cadenzas (as with the other embellishments to the score) by Brautigam are completely in keeping with the spirit of the score & they sound so natural and inevitable that one has to pause to reflect that these were not from the pen of Mozart himself. 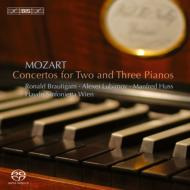 Between the two concertos, comes another of Mozart&apos;s concertante works involving the piano, "Ch&apos;io mi scordi di te?" for soprano and orchestra with obbligato piano. 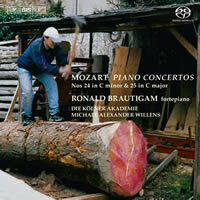 There is a recently recorded modern instrument version (Mozart: Un moto di gioia - Persson / Weigle - also BIS!) that vividly highlights the differing merits of each approach when heard in combination with this account. Both versions are very persuasively performed in their equally captivating ways; those favouring period instruments will not be surprised to learn that thanks to the slimmer tone of the instruments, Carolyn Sampson does not need to project her voice so forcefully above the tutti passages. Some will prefer this more vocally relaxed rendition, others will prefer the more viscerally exciting approach from Persson. The concerto that is the first of Mozart&apos;s astonishing sequence of mature compositions in this genre completes the disc. Once again, the various tone colours that are given by period instruments give added impetus to the musical argument (such as Brautigam supplementing the bass line in the orchestral tuttis) without distorting the line of the musical phrases. 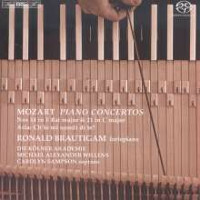 With the carefully chosen orchestral size, the declamatory gambit from Brautigam truly matches the preceding orchestral tuttis; this copy by Paul McNulty of a Walter & Sohn fortepiano is a very fine instrument for this music indeed. As with the conclusion of the 21st concerto, there can be no doubt that all concerned are following Mozart&apos;s entreaty to play the opening Allegro with vivace; their collective responses to the this score rightly points the way towards early Beethoven without ever forgetting where they wish to place their soundworld. The slow movement is as eloquent as one could wish and Brautigam conspires with Willens to walk with perfection the cusp of Elysian delight with the threatening undercurrents. 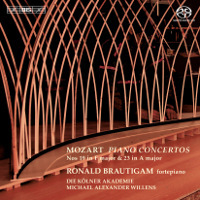 Another ebullient rondo concludes this concerto (and this disc); again the balance between Brautigam and the Akademie is a delight to the ear - the orchestra throws a translucent cloak around the passagework of the piano while letting the fortepiano&apos;s melodies soar across. 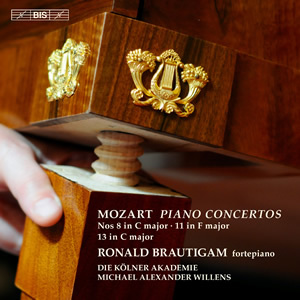 The sound is as self-effacing as Brautigam&apos;s virtuosity; so enrapturing are the performances and so transparent is the sound that one completely forgets about such matters - surely the sign of a very fine engineering team in this sonically modest repertoire. Those wanting modern instrument versions can safely turn to a fine alternative from Christian Zacharias (Mozart: Piano Concertos, Vol 6 - Zacharias). To do so though would be to miss out on quite extraordinary virtuoso playing that is entirely self-effacing even when indulging in the tasteful rubato that adds, never detracts, from the expressive musical line of Mozart&apos;s argument. One cannot but admit that after a searching start and questionable comments in some quarters, this cycle is now going from strength to strength. As indicated by Polly Nomial in his most eloquent and poetic review of these two concerti, you won’t find at this moment any better period performances. Neither in terms of artistic maturity nor in respect of natural balance. 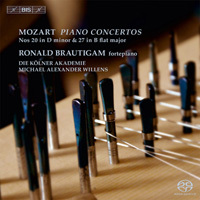 Over the last couple of years Brautigam, Willens and… BIS have grown into a wonderful team enriching the catalogue with refreshing and for many ‘must have’ alternatives for the ageing RBCD period performances by the likes of Bilson (Archiv), Levin (Decca) and van Immerseel (Channel Classics). I have commented in the past that Brautigam’s slow movements were mostly on the fast side. That is why I started off with the second movement of concerto no. 21 (KV 476), in the realm of ‘the millions’ better known as ‘Elvira Madigan’, to find out if Ronald Brautigam would sufficiently allow the andante to blossom. Fast? Yes, but somehow or other it did not disturb me. Unable to stop listening I played the rest in one go, before allowing myself to compare both concerti with other period performances, notably Malcom Bilson with John Elliot Gardiner and his Baroque Soloists. So, what about Bilson? 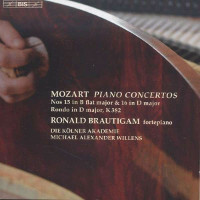 As far as timings are concerned, Brautigam is, except in the final movement of no. 14, on the whole faster (Bilson between brackets): KV 467 - 13’05 (14’06), 5’04 (6’09), 6’19 (7’23); KV 449 - 8’31 (8’28), 5’35 (6’21), 5’55 (5’50). This being so, how does that translate into the listening? To a certain extent quite a bit. Especially in no. 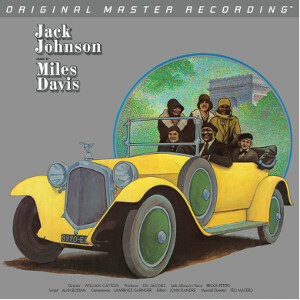 21, the major work on this disk. Bilson’s andante is in the old tradition: Slow and even a bit sluggish, but not as bad as the standard of thirty years ago, which clocked around 7 minutes or even slower (Barenboim/Berlin Philharmonic took no less than 8’20 minutes, which many may now describe as ‘boring’!). Bilson fills in some gaps with ornamentation (which is perfectly acceptable as it was done in Mozart’s time as well), but the balance between soloist and orchestra loses focus and tends to fall apart, also rhythmically. One might say: More Adagio than Andante, which, in its French equivalent (‘allant’), supposes a pace with ‘active energy’. 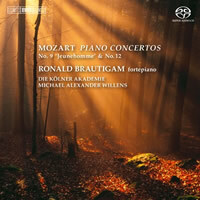 Brautigam’s pace is, indeed, brisker, without giving the listener the feeling of being unduly fast and hasty. Certainly no dramatic schmaltz here, which some of the ‘old school’ would perhaps have preferred. Tempo is a difficult notion anyway. Even if timings are similar, there still is a difference between ‘fast’ and ‘rushed’. It is all a matter of ‘how’ it is played and how the orchestral support follows suit. In the outer movements of 21 Brautigam is, indeed, markedly faster than Bilson, without conveying, however, a sense of rushing things to the end (or, as I&apos;ve read somewhere: ‘making a faster buck’). The way he and Willens’ players are handling this turns the final movement into a ‘sparkling’ affair; thus bringing this concerto to a gloriously gripping conclusion. Differences may partly be due to the instrument used and the recording. 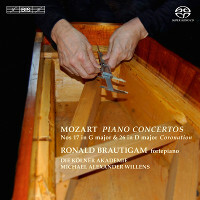 Both fortepianos are copies of the Walter used by Mozart, but Bilson plays on an ‘older ‘copy by Philip Belt (1977, New Haven, USA) whereas Brautigam has a newer one by McNulty (2012, Divisov, Czech Republic), which has a more crystalline sound, giving it presence and sparkle, without becoming dominant. 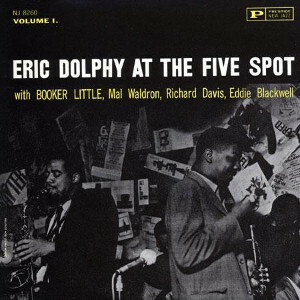 Furthermore, the Polidor International sound engineers (Bilson) have put the piano more in the framework of the (larger) orchestra, thus giving it less emphasis. In KV 449, speed does not seem to be much of an an issue. Both stick fairly close to one another, except, once again, in the slow movement. But if I may as yet allow myself a peek in the fruit basket, just for comparing timings between the apples and the pears, I note that some of the Great Interpreters playing on Concert Grands are faster than Bilson, taking around 6 minutes for the Andantino, although no one comes close to Brautigam. Only Geza Anda is faster in the outer movements. The funny thing is that the missing 25 seconds don’t make any other difference than that Brautigam sounds more assertive. If that corresponds to your taste then you are here in good company. As mentioned above, I fully subscribe to Polly Nomial’s review and will, therefore, not repeat what he has said. And I will also refrain from such ‘banale’ qualifications like awesome, though I do admit that I was nonetheless pretty flabbergasted (to use another, outdated (?) 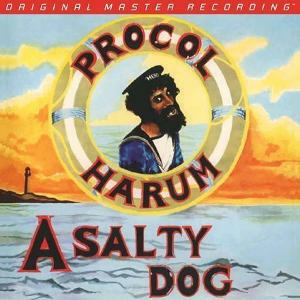 popular expression). Seldom does one hear such a perfect balance between soloist and orchestra. A fortepiano is best paired with a small sized orchestra. And the fewer strings of Willens’ band (14 against 22 for the English Baroque Soloists) give ample room for the wood&other wind instruments to shine. I am eagerly awaiting the final installment which I have now ordered. As for the exemplary recording BIS has gone another step forward to perfection, while sound engineer Bastian Schick has found a way to get rid of disturbing mechanical noises. The bottom line: Recommended without any reservation, even for those who think they are allergic to period performances. Note: When comparing one cannot avoid labeling one interpretation better than another. In this particular case I feel compelled to stress that Bilson/Gardiner remains an excellent choice for RBCD and confirm that the recorded sound in view of its ‘age’ (1983) is quite remarkable.